Your favorite tootsie pop is now available in a miniature tootsie pop. Same great pop with the tootsie roll center, just half the size. 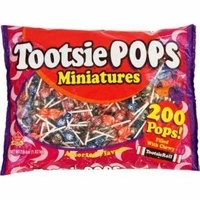 You get 200 Mini Tootsie Pops Per bag in assorted flavors. Many parents rather the mini's for their children as the originals just take to long to eat. If you want the original tootsie pops we have them too.